The Olympic League Tournament is the season-ending tournament for the top 8 singles players and doubles teams in the league, each vying for a spot in the finals, which would qualify them to represent the Olympic League in the prestigious CIF Individuals tournament. This may be the premier high school team tennis tournament in the country, with the top 2 singles players and doubles teams from every league in the CIF Southern Section (all 5 divisions combined) coming together to compete to determine the best singles player and doubles team in the CIF Southern Section. 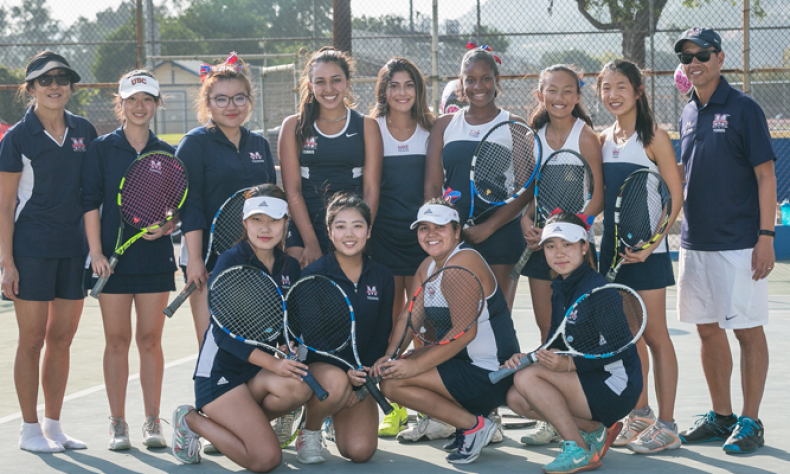 After the first day of league prelims, the Lady Minutemen will fill all 4 of the available eligible CIF Individuals slots, as #1 and #2 seeded, Angela Hsieh and Malena Smith, and #1 and #2 seeded Maddie Hernandez/Michael Wilkins and Hellen Hong/Stella Wang all advanced to the league finals on Wednesday. On the first day of the two day Olympic League tournament, top seeded Angela Hsieh (45-5 overall, 27-0 in league) continued her league dominance by defeating #4 seeded Kailani Kane of Valley Christian, 6-0-, 6-0 in the semi-finals. In the other semi-finals singles match, #2 seeded Malena Smith (38-9, 27-0) defeated Joyce Gao of Whittier Christian, 8-1 in the quarterfinals, then won, 6-1, 6-4, over Whittier Christian’s Kayla Koba in the semfinals. #1 seeded Madelyn Hernandez/Michael Wilkins (37-9, 27-0) marched to the finals without a glitch, winning their quarterfinal match, 8-2, against #8, Elizabeth DeGroot/Emma Montenegro, from Valley Christian. They then defeated #5, Adrianna Vasquez/Makani Kane, also from Valley Christian, 6-2, 6-3. #2 seeded Hellen Hong/Stella Wang (30-19, 22-6), are easily the surprise story of Maranatha’s season. They started the season without even having a starting spot secured; but they grew steadily all season, both in play and in their team chemistry, and rode the surge all the way to the #2 seed. They defeated #7, Hannah Cierlak/Tianna Sandberg, of Heritage Christian, 8-4, then #3 Sofia Struiksma/Mary Lou Ruiz of Valley Christian, 6-3, 6-4. After losing a heart-breaking first set in a tie-breaker that went 9-11, Hernandez/Wilkins quickly went down 1-5 in the second set and were on the brink of elimination. They fought back, staving off match points along the way to even the score at 5-5, eventually winning the second set, 7-5. In the 3rd set Super Tie-break (up to 10 pts.) to determine who would advance to the finals and the CIF Individuals berth, the #2 seeds were down 6-8 before tying it 8-8. They then faced another match point at 8-9 before winning the final 3 pts. and coming away with the 11-9 win. Tomorrow’s singles and doubles finals will be an all-Maranatha affair, each featuring the top 2 seeds. All will represent the Olympic League in CIF Individuals.